Beginning in the 1950s, television transformed the lunch box from an ordinary food conveyor into a storyteller. The screen-like sides of the lunch box offered kids a new form of self-expression. Since then, the lunch containers carted to and from offices and school classrooms have reflected American culture. Certainly, no meal received more cultural “attention” than lunch. Box makers paid for the right to use TV shows to promote lunch box sales. The studios used boxes to gain market exposure. And children acquired a new statement of their power and influence in the emerging world of mass-marketed consumer goods. 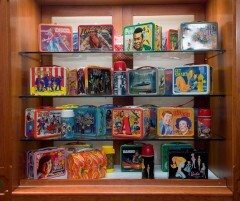 This selection of boxes and their drink containers from the collections of the Smithsonian’s National Museum of American History explores that colorful heritage. And to spice up what may be a loooong day at the office, share with us what your favorite lunch box was while growing up! No question: I had a Star Wars lunchbox that was pretty damned awesome. Embarrassing truth: I also had an Alf lunch box. Yes. That Alf. Mine was, to no one’s surprise, a battered Empire Strikes Back metal box. I used it for nearly six years until the thermos’ art wore off completely and rust started taking over the inside lid. Then it got relegated to “dice holder” for my high school gaming days.